Traditions are a vital part of the fabric that makes up our society and our families. With everything in the world attempting to pull us apart from one another, it is our traditions that calls us together once again. While you may not think that traditions have much to do with interior design, they’re actually quite important. Traditionally designed living spaces have much the same effect on our moods, attitudes and overall happiness that real, honest traditions do. It’s for this reason that many homeowners will elect to design their living rooms in a traditional way. Given that the living room is, in many ways, the beating heart of any home, it’s important that this space create the convivial atmosphere that tradition creates. However, while it’s nice to think of having a traditional living room, it’s another thing all together to actually design one. For this reason, we’ve decided to collect 23 examples of living rooms that get traditional design right. As you’ll see, though, being traditional doesn’t mean being boring. Instead, you can apply traditional living room design concepts and schemes to virtually any style and personality you might imagine. And, if you do, you’ll end up with a warm, inviting space that will be a joy for you, your family and your home’s guests. Let’s take a look. 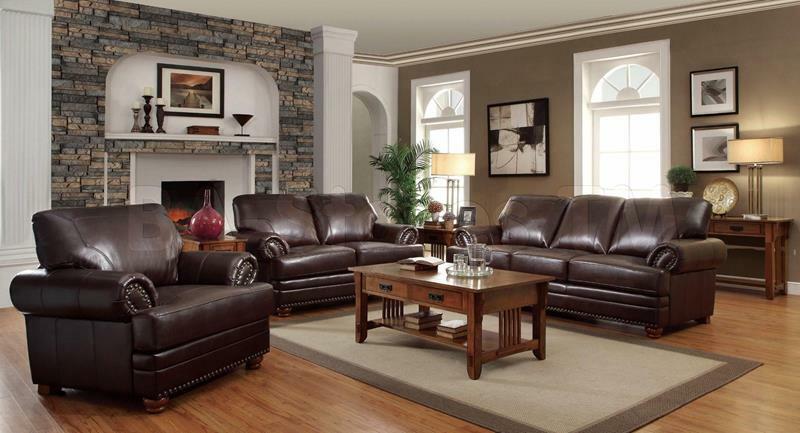 When you’re designing a traditional living room, leather furniture pieces should always be under consideration, particularly if they’ll be balanced by wood tables. In order to add contrast to this traditional living room design, dark curtains have been used around the windows and French doors. With light, yellow walls, this traditional living room has brightness to give, which makes the choice of darker furniture a sound one.